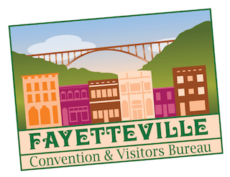 We are excited to announce West Virginia’s World War II living history weekend Saturday, May 4, in downtown Fayetteville West Virginia. This event is being hosted by the World War II Living History Foundation Inc, a nonprofit organization dedicated to bringing history to life and committed to historical accuracy to educate future generations. Watch history come to life with authentic recreations of Allied and Axis army encampments. Relive the stories of our veterans as we preserve history and honor the greatest generation. Veterans and living history enthusiasts from all over the state will be represented. We are honored to have West Virginia native Woody Williams in attendance; he is the sole surviving Marine from WWII to wear the Medal of Honor. Step back in time as storefronts are transformed in period complete with World War II vehicles. Make it a weekend getaway and get an early start on the action by joining us Friday evening at the Officer’s Club Dinner at The Station from 6pm to 8pm. Saturdays’events will kick off with a parade at 10:45am followed by a mainstage tribute to our veterans and kick off program. Enjoy live performances on the main stage from 11am-6pm including performances of Andrews Sisters songs by the Everly Sisters, and big band swing music by the New River Jazz Band. Explore living history displays from uniforms to bicycles, and cars while reactors portray soldiers and civilians during wartime. Enjoy a period fashion show featuring the clothes and hairstyles from the era. World War II veterans will be invited to share their stories throughout the day. There will be a Biergarten on site featuring Bridge Brews German Pilsner & English Ale selections prepared especially for the occasion. WWII DAY WV celebrates West Virginia’s critical contributions to America’s victory whether the valiant work of our soldiers or the support of our home front families. The Everly Sisters sing The Andrews Sisters! Beer Garden, Food Booths….And More! *We will not in any way be affiliated with radical organizations (ie American Nazi Party, KKK, Aryan Nation, etc.” and fully condemn the philosophies and actions of the NSDAP (Nazi party). WWII Weekend WV is a non-profit organizing a grassroots community event. We need your help to make this awesome event happen. This event is ambitious, as it is positioned to become the largest event of its kind in the state, To realize its full potential we will need lots of support. We welcome and encourage any and all municipalities, civic organizations, non-profits, and businesses to jump in with any ideas that they may have. Of course any and all citizens are welcome too! We are trying to systematically reach out to form partnerships but we are a small team with a short deadline. Please know that we would love to talk with you about getting involved in this exciting event Please don’t hesitate to reach out via this page and we will respond! Let’s Never Forget together! Email [email protected] for sponsorship opportunities and information.